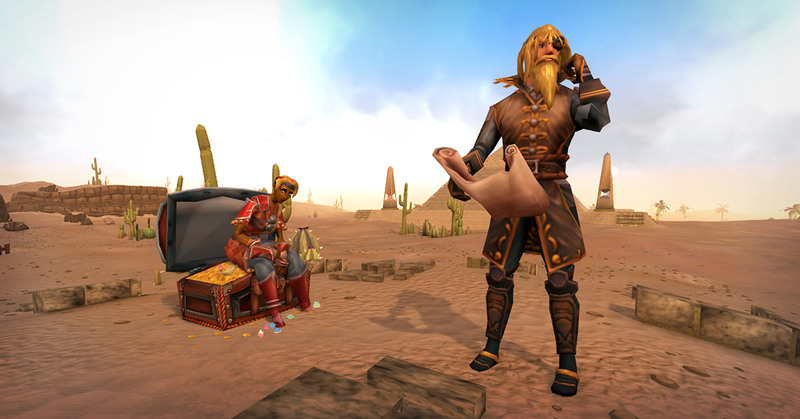 There's a new way to pick up prizes in Treasure Hunter. From 00:00 Game Time on 10th May until 23:59 Game Time on 15th May, get hunting for Buried Treasure. For that duration, your Treasure Hunter interface will be transformed into a grid-based map, and you'll open chests by clicking on squares within it. Each square contains at least a normal chest, but 6 per grid will contain a special chest, containing a trove of 4 or 5 prizes. These come in four types, which can contain different types of items and the amount left to find on your grid will be displayed at the side of the interface. *Note that the antique chest will always contain at least one piece of these two outfits, unless you already own both – in which case it will contain rare tokens. There's also a chance that any of these above chest types will contain a special prize: a Treasure Chest rest animation, a held Treasure Map item, or a much rarer chance to get a lucky item (including retired ones). Here's hoping you find your way to some top prizes. See you in game! The treasure chest animation could use some more work and polygons on the contents of the chest. Seems interesting. Will have to see how it goes. Pleased to hear that I might get some rare item tokens out of it, though! Is there any particular quantity of tokens given? I like that we can find lucky items; looks set to be an interesting and rewarding promotion. Well it is about time you buried this thing. Stale as can be, time for a re-design. And don't try to tell me Alice is a good character, or is good for business. Get real. Another week, another promo with abusively low chances of exclusive animations and items that some would be glad to buy on SGS but they can't because HMC is the pinnacle of greed. Where has your respect gone, MTX Team? And I don't mean respect for us, we all know that evaporated years ago - Where's your respect for yourselves? Fullblown non-playing lurker since 26/06/17. May come back if both the devs and the MTX team get their bloody act together. It's a long wait for another elite skilling outfit.